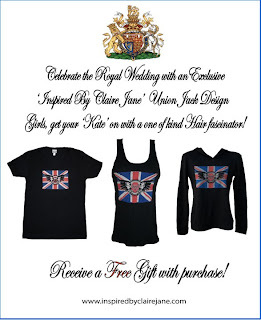 Show your love for the Royal Couple with an ICJ Tee! In case you didn’t know The Royal Wedding is on Friday. If you did not receive your invite you can still show your support with an ICJ Union Jack design shirt. Girls, emulate Kate's fashion sense with a one-of-a-kind hair fascinator. If you purchase by Friday you’ll also receive a free gift. So what are you waiting for mate? Visit http://www.inspiredbyclairejane.com/ and show your love for Will and Kate.